I do not propose here to choose a side in this polemic; far from it, what I want to show in these pages is that the argument is irrelevant because both sides proceed on the basis of false premises about the nature of Maoism. The common understanding on the Left of the political conflicts within the Chinese Communist Party [CCP] is mistaken: the "left-wing way out of Stalinism," which many see in Maoism, is a political mirage. There is as little reason -- or less -- to regret the defeat of the Maoist "Gang of Four" as there is to celebrate the victory of the "number-two person in power following the capitalist road" (as Deng was known during the Cultural Revolution). To demonstrate the validity of these judgments will require a close examination of Mao's socioeconomic policies and of the struggle within the Party bureaucracy. Over the last decade a new consensus on the nature of Maoism and its relation to Stalinism has emerged among Western China-watchers. During the early 1950s, the story goes, the CCP uncritically imitated the Soviet political and economic system, with the result that Chinese society became increasingly hierarchical and authoritarian. Once Mao realized where the Soviet path was leading China, he rebelled and set out to find a new "Chinese road to socialism," more consistent with radical principles of egalitarianism and mass participation in decision-making. Mao devoted the last twenty years of his life to the struggle -- against stubborn opposition from a conservative Party bureaucracy intent on retaining its power and privileges -- to subordinate China's economic development to socialist values of equality and democracy. Thus Maoism represents a total break with the economic and political doctrines of Stalinism: this view has become part of the conventional wisdom of current China scholarship, and is shared by writers of almost every political position. To be sure, there are differences of interpretation or emphasis; radical scholars, for example, describe Mao as the leader of a coalition of workers and poor peasants in a "class struggle" against the would-be new ruling-class and its allies, while liberal academics portray him as a visionary, a man in revolt against the canons of Weberian bureaucratic rationality, striving futilely to keep the spirit of revolution alive. Although liberals and radicals disagree on the feasibility of Mao's goal, and whether it was shared by the majority or imposed from above, there is no disagreement over the nature of his goal: to immediately begin the transition to communist social relations. It is this consensus which I would like to call into question. China's political struggle of the last twenty-five years should not be seen as a confrontation between a Stalinist orthodoxy which dictates economic development at any cost and a Maoist alternative which places human values above economic. Rather, the split within the Chinese ruling class has centered on a more mundane topic, the optimal rate of economic growth, and has juxtaposed two conflicting development strategies -- one, advocated by Mao Zedong, being fast but risky; the other, proposed by "Capitalist-roaders" like Deng Xiaoping, slower but more dependable. No one would deny that "moderates" like Deng have been primarily concerned with economic growth; I will try to show that the same is true of the Maoist faction, despite its facade of populist and egalitarian rhetoric. Furthermore, I will argue, it was not Mao who renounced Stalin's economic priorities, but his opponents; Mao wanted to retain the essential features of the Stalinist development program, making only such changes as were needed to adapt the Soviet model to Chinese economic realities. In order to demonstrate this, it will be necessary to return to the origins of the "struggle between the two lines" in the 1950s, for. it was then that the economic battle lines between "left" and "right" were drawn. The bulk of this article will recount, in some detail, the emergence of the conflict during the 1950s; I will then attempt, more briefly, to show that the same issues continued to be the focus of debate in the 1960s and 1970s. But first we must clarify the meaning of the key term, "Stalinist development strategy," so as to avoid certain confusions which have become endemic to recent China scholarship. Throughout these pages, I will be using such terms as "Stalinist model" and "Stalinist development strategy" in a very specific and restricted sense, referring to the set of interrelated policies applied during the USSR's First Five-Year Plan. The later Five-Year Plans have, of course, much in common with the first, but it was the economic program of 1929-32 which embodied the principles of Stalinist economics in their purest form. The following decades saw a gradual drift away from the pure Stalinist model, in a direction which might be called (the term will be explained presently) Bukharinist. It is customary, at least in writing about China, to include the entire history of Soviet economic policy under the rubric of "the Soviet model," a term used interchangeably with "Stalinist model." Although this broader definition is perfectly appropriate for most purposes, the failure to differentiate between variations of Soviet economics has contributed (as will become clear in due course) to the general confusion about the relationship between Maoism and Stalinism. Agriculture made a major contribution to the growth of heavy industry; the countryside provided a pool of cheap labor, which could be transferred to the cities as needed, and the peasants' labor provided food and raw materials for the consumer industries, which provisioned the growing urban workforce, as well as agricultural exports, which were exchanged for Western capital goods. To give the peasants something in return, more consumer goods or agricultural tools, would have drawn resources away from heavy industry; thus, the agricultural surplus product was extracted without offering anything in exchange. Forced "collectivization," (6) which amounted to a war waged by the ruling class against the peasantry, gave the State control over the peasants' land and labor-power, making it possible to extract the agricultural surplus relatively efficiently. One effect of this policy -- which, as we will see, made the Stalinist model unworkable in China -- was a long-term stagnation of agricultural output, for the peasants had little incentive to produce more. These are the main features of the Stalinist strategy. In the late 1920s the "Bolshevik Right," led by Nikolai Bukharin, charted a different path to industrialization. (7) Their main disagreement with the "Left" was over agricultural policy. Remembering the 1920-21 rural uprisings that had been provoked by wartime grain requisitioning, Bukharin feared that a renewed assault on the peasants would drive them to rebel again. Instead, they should be persuaded to hand over their crop surpluses by offering them farm tools and consumer goods in exchange. Industry should therefore be oriented towards serving the needs of agriculture. Heavy industry's growth would necessarily be slower in the short run, but it would eventually benefit from the larger surpluses created by agricultural investment. In this strategy, the flow of resources from country to city would be maintained (by taxation and by manipulation of the ratio between the prices of industrial and agricultural goods), but at a slower pace, so as not to antagonize the peasants. Compulsory collectivization was ruled out. Since investment would not be forced into heavy industry, there would be no need to immediately substitute planning for the market; instead of subsidizing heavy industry, all State industry would be required to operate at a profit. These are the poles between which state-capitalist economic policy oscillates: when the bureaucracy becomes disillusioned with the extreme form of the Stalinist model, it has nowhere to go but to the "Right," that is, towards the Bukharinist model. Nikolai Bukharin is thus the patron saint of all state-capitalist "economic reformers," even if they do not always remember to light a candle at his altar. Examples of pure Stalinist economics are rare: the USSR during the First FYP; most of Eastern Europe in the early Cold War years; China in 1953-54 and again during the Great Leap Forward. Yugoslavia has moved the farthest in the other direction, but it is not entirely alone; to one degree or another, concessions to the Bukharinist strategy (or, as it is more often known, "market socialism") are the general rule. In the People's Republic, Bukharinist tendencies were kept in check by Mao, but have flourished since his death. "Learn from the Soviet Union"
By maximizing the rate of exploitation and concentrating all resources on a single goal, Stalin's crash industrialization program did succeed in achieving that goal: heavy industry advanced rapidly. Steel production, for example, increased by 48 percent during the first plan; oil, by 83 percent. It was this success story which the Chinese were to try to emulate in their own First Five-Year Plan, begun in 1953. However, China adopted the Stalinist development model at a time when it was already beginning to come into question throughout the state-capitalist bloc, including the Soviet Union itself. Stalin's death in March 1953 made it possible to criticize his economics; by September, Khrushchev had described in the pages of Pravda the failure of Soviet agriculture under Stalin: grain output, he revealed, had increased by only 10 percent since 1940, and there were fewer livestock than there had been forty years before. Malenkov proposed an economic "New Course," which would increase investment in light industry and agriculture. Throughout Eastern Europe, the Stalinist pattern of crash industrialization, which had been applied from 1949 to 1953, was being reconsidered. (8) The CCP leaders were not insulated from Soviet and Eastern European influences; their readiness to back down from the classic Stalinist model when it foundered in China was no doubt encouraged by the "rightward" trend within the bloc. Inadequate business management, low productivity, and failure to complete the production plans are all blamed on the workers and ascribed to their breach of labor discipline. ... The management of some enterprises often shift the responsibility for injury and accidents to the workers .... For instance, the grinder on the 'chlorine trough' in Workshop 52 of the Shenyang Chemical Works has no safety equipment. The workers had pointed this out but the workshop took no action, with the result that an accident occurred where a worker had his fingers cut. Analyzing the causes for the accident, the man in charge of the workshop put it 'carelessness on the part of workers.' ... The worker who had lost his fingers was fined one month's bonus and made to criticize himself before the public .... In other instances, when a serious loss has resulted to an enterprise due to an accident, the worker responsible is sent to the people's court to be punished as a criminal. The author of this editorial was attacked during Mao's Great Leap Forward as a "bourgeois rightist"; this and other examples of muckraking were among the "crimes" against the proletariat for which he was condemned. In agriculture, the Stalinist path was followed much more hesitantly and cautiously. (15) As originally envisioned, collectivization was to take place in three stages, spread out over a period of about fifteen years. The process would begin with the formation of mutual aid teams -- each composed of five to twenty households -- which would systematize and extend the traditional pooling of labor, tools, and animals without making any changes in property relations. In the second stage, several teams would be united in a cooperative, in which work would be organized collectively but the peasants would retain title to their land, and would be paid partly according to the amount and quality of the land they contributed. Finally, the cooperatives were to be amalgamated into collectives -- each the size of a large village, or about a hundred families --in which land, large tools, and draft animals would be owned "in common" and payment would depend solely on labor. By the middle of 1952, some 40 percent of peasant households, most of them in the "early liberated areas" of North and Northeast China, had joined mutual aid teams; only a handful (0.1 percent) were in cooperatives. The first serious attempt to organize cooperatives occurred in the spring of 1953 (roughly coinciding with that year's industrial speed-up), and was preceded by a purge of around 10 percent of the rural cadres. This mini-collectivization drive reached its peak in March, and was then reversed; 29 percent of the cooperatives were disbanded, and the cadres were criticized for the "brutal measures" they had used in forcing the peasants to sign up. While the number of cooperatives doubled, it still remained insignificant. Although this first experiment was not very successful, the imperatives of rapid industrialization demanded that the bureaucracy gain more control over agriculture, all the more so when a new trade agreement with the USSR, requiring more agricultural exports, was signed in the fall. Since the peasants had proven unwilling to hand over their produce to the State at below-market prices, a new law was enacted in November 1953: henceforth, all "excess'' grain would be bought at prices set by the State. "If socialism does not occupy the rural front line then capitalism will," Mao declared, and there was a new push to organize the peasants. By mid-1954, some 60 percent were organized, but still mostly in mutual-aid teams; only 2 percent belonged to cooperatives. From fall 1954 to spring 1955, the campaign was resumed, and the proportion of rural households in cooperatives increased to 14 percent. The number of collectives was miniscule. There was a long way to go to full collectivization, or so it seemed. Unlike the Soviet Union, the People's Republic was unable to consistently extract an agricultural surplus large enough to maintain rapid industrial growth. The reason lay in a fundamental difference between the China of the 1950s and the Russia of the 1920s, a difference which was to make the Stalinist model unworkable in China. In the Soviet Union, it was possible to offset a poor harvest by decreasing the peasants' consumption; State procurements did not have to be lowered. But China's peasants lived too close to subsistence level to permit any cut in living standards: China's per capita grain production in 1952 was not quite 60 percent of the USSR's in 1928. (22) Not only was China's potential agricultural surplus so small that a bad harvest could virtually wipe it out, but also any attempt to preserve the surplus at the expense of consumption would court disaster. To persist in squeezing grain out of the peasants after a crop failure would drive them to the wall, and they would retaliate by slaughtering draft animals and destroying tools, which in turn would further reduce production in the following years. This meant that a fundamental departure from Stalinist orthodoxy was essential. While the Soviet bureaucracy could afford to let total farm output stagnate, since it could in any case lay its hands on a sizable surplus, in China an increase in total output was necessary to guarantee a reliable surplus. A purely extractive, Stalinist approach was thus not feasible. With the Five-Year Plan in trouble after only two years, the CCP had to begin to recognize that a quick push for heavy industry was impractical. In fact, opposition to the Plan's basic strategy had already been voiced in 1953, when unnamed critics were officially quoted as demanding more investment in light industry and agriculture and a rise in living standards. (23) By early 1955, it seems that most of the top bureaucrats had come to accept the (essentially Bukharinist) logic of the critics' position. In the vanguard in developing a new policy was a group of economic experts within the Party, Chen Yun being a notable example, but the turn to the "right" apparently enjoyed wide support at the highest level of the apparatus. As a result, there was a general retreat from the Stalinist line of 1953-54. The collectivization drive which had started in the fall of 1954 was halted, about 3 percent of the cooperatives were allowed to dissolve, and the rural cadres were again criticized for their use of economic pressure (i.e., raising the taxes of those who refused to join co-ops) or physical coercion. In the future, it was stressed, collectivization would be purely voluntary, and a low rate of formation of co-ops was projected for 1955. The burden of State procurement quotas was lightened, and the peasants were promised that there would be no increase in quotas for three years. The terms of trade were to be somewhat less unfavorable to the countryside. In industry, the speed-ups were denounced as "guerilla methods," inapplicable to modern industry; trade union cadres were criticized for having shown a lack of concern for the welfare of the workers. Light industry was to receive a greater share of investment, providing more consumer goods for workers and peasants. The policy of social peace was even extended to the capitalists: fearing a capital strike provoked by rumors of imminent nationalization, the Party relaxed its control over business transactions, returned a few shops that had been nationalized in 1954-55 to their original owners, and reassured capitalists that they would continue to play a major role in the economy (24). It is not clear how far China's Bukharinists had progressed in working out the particulars of a long-run solution to the main problem: the unreliability of the agricultural surplus. Investment in agriculture was part of their program, but what kind of investment? Tractors were clearly not the answer: they could not yet be produced in the required numbers, and the available models were not suited to most of China's agriculture. In the event the "Right" was not in a position to work out a full solution in practice until the early 1960s; but the general direction to be taken must already have been obvious in 1955: increased application of fertilizers, expansion of the amount of land under irrigation, etc. Whether the Party would have been willing in the mid-1950s to accept the large shift of investment funds required to make such a program work will never be known; but, in the long run they were to have little choice. Meanwhile, Mao thought he had a better idea. The most obvious drawback of the slow-growth strategy, from the point of view of the bureaucracy, was that it implied a long period of dependence on Soviet economic aid: if the emphasis was to be shifted to light industry and agriculture, the building of an independent heavy-industrial base would have to be delayed and capital goods would have to be imported for years to come. The Russians would certainly try to parlay their economic leverage into political control. This prospect could not have been pleasing to Mao, who had once told Edgar Snow, "We are certainly not fighting for an emancipated China in order to turn the country over to Moscow!" (25) In addition, the Bukharinist strategy would postpone the day when China would join the front ranks of world powers, and this must have been equally displeasing to Mao, who repeatedly stated that, "We must ... build our country up into a powerful modern socialist state" and "We shall catch up with Britain in fifteen years." (26) Such nationalistic sentiments were, I would argue, the most important motive behind Mao's search for a developmental model that would salvage the prospect of rapid modernization. Three aspects of Mao's program will be examined here: its continuities with the original Stalinist model; its solution to the problem of the agricultural surplus; and its ''egalitarianism." (1) At the core of the Maoist program was the very same set of policies that were enacted in Stalin's First Five-Year Plan: immediate nationalization, industrial speed-up drives, collectivization of the peasants, general austerity. And these measures had the same overriding goal as in Stalin's program, the fastest possible development of heavy industry. This point needs to be underlined: its full significance has not often been grasped. Thus, one noted scholar can write that "the Great Leap Fonvard marks the triumph of the Maoist approach over Soviet models,'' even though he recognizes that the Leap "does not mark a decisive break with one of the main features of the Stalinist model. ... There was to be no diversion of investment inputs from the heavy industrial sector." This statement does not do justice to the continuities between Stalinist and Maoist economics; for, the exclusive focus on heavy industry, which Mao borrowed from the Soviet First Five-Year Plan, entailed more than merely "a Stalinist conception of capital allocation. " (27) It also entailed a wide range of corollaries which touched the lives of every social group, from urban workers (the speed-ups) to the peasants (forced collectivization). A number of additional similarities between Stalin's first plan and Mao's Great Leap Forward [ GLF] might be noted: for instance, the continual raising of production quotas from the attainable to the implausible to the impossible, coupled with attacks (under the guise of "class struggle") on all those who questioned the targets; the proliferation of military terminology -- the "production front," "battles" with nature, etc. -- with its emphasis on discipline and self-sacrifice; the insistence that all art and literature must serve to indoctrinate the workers and peasants in this ethic of military discipline and self-immolation; and the use of a rhetoric of mass participation to disguise increased exploitation. This last is worthy of particular consideration, for Western Maoists claim that workers' participation in management was one of the points on which Mao departed from Stalinist orthodoxy. Yet, participatory rhetoric was just as much a part of Stalin's economics as of Mao's. Stalin's speed-ups were always officially described as products of the workers' spontaneous demands. We do not need to turn back to the Soviet propaganda of the 1930s to see this; contemporary Stalinists continue to make the same claim. Thus we hear that Stakhanovism "arose from the initiatives of individual workers themselves .... What in other countries has generally been devised by functional foremen and efficiency experts, often in the teeth of relentless hostility from ordinary workers, was now being initiated by workers themselves." (28) Another eulogist of Stalin's Russia speaks of "the participation of workers in criticizing the five-year plan and drawing up revised plans of their own.'' (29) " In practice, talk of "mobilizing the masses" and "relying upon the creativity of the masses" has always signified a Stalinist-style crash industrialization, in China as much as in the Soviet Union and Eastern Europe. Pro-Maoist scholars point to the fact that Mao was a severe critic of Soviet economics, including Stalin's own writings. (30) What they overlook is that Mao's attacks were leveled at the (post-Stalinist) Soviet economic orthodoxy of the 1950s, and at Stalin only insofar as he moved away from the pure Stalinist model in his later writings. Mao's references to the Soviet First Five-Year Plan, though infrequent, are invariably favorable: "At that time  Stalin had nothing else to rely upon except the masses, so he demanded all-out mobilization of the party and the masses. Afterward, when they had realized some gains this way, they became less reliant on the masses." (31) Mao's reproach to Stalin was, it seems, that he stopped being a good Stalinist. Nor was Mao too hard on China's economic planners for their emulation of the Stalinist model in their own First Five-Year Plan; in fact, he stated that the first plan, though it "lacked creativity," was "basically correct." (32) It was only when the planners questioned the cardinal Stalinist principle of priority to heavy industry that Mao balked. If many writers have missed the essential point -- that Mao rejected the Soviet economic orthodoxy of the 1950s only in order to revive an earlier, and more repressive, Stalinist orthodoxy -- this is at least partly because they fail to distinguish between variations of the Soviet model, and therefore assume that the rejection of one particular variant is equivalent to discarding Soviet economics as a whole. (2) As we have seen, the fundamental weakness of the Chinese economy was agriculture's inability to consistently provide an adequate surplus product, which caused industrial growth to fluctuate from year to year and made long-term planning impossible. The precondition for steady and rapid industrial growth was thus an increase in farm production. The appropriate technical measures to be applied were fairly clear: wider irrigation and improved flood control, more fertilizers, some kind of mechanization, etc. Up to this point, China's "Left" and "Right" could agree. The disagreement arose over the question of how to reach the common goal. The "rightist" approach -- which did not fully emerge until the early 1960s -- was to increase the share of central investment in agriculture, producing chemical fertilizers and pesticides, small pumps to mechanize irrigation, and other small machines such as garden tractors. (33) Obviously, investment would have to be diverted from heavy industry; moreover, the program could not be expected to accomplish any dramatic results in the immediate future, and therefore implied a lengthy delay in the industrial take-off. Mao's "Left" refused to accept any such postponement; they insisted that a plentiful agricultural surplus could be created almost overnight, and without a major diversion of central investment into agriculture. (34) Thus the basic principles of Stalinist crash modernization need not be discarded. The key assumption of Mao's rural development program was that the technical transformation of agriculture could be achieved -- at little or no cost to the State -- by mobilizing un- and underemployed labor and economically marginal natural resources which would otherwise be unutilized. Large-scale labor mobilization projects were one pillar of the Maoist program: vast labor armies would be put to work building irrigation canals and dikes, collecting organic fertilizer, killing natural pests, etc. The second major motif in the "leftist" strategy was rural industrialization: small factories would be set up everywhere, financed by the local peasants; the best known example being the backyard iron and steel furnaces of 1958. These local plants would produce mainly agricultural means of production, such as small tools and chemical fertilizers. It should be stressed that rural industrialization was not an end in itself, inspired by a vision of narrowing the gap between country and city, so much as a means of avoiding the transfer of central investment away from heavy industry. A third category of Maoist policies included several reforms of agricultural technique, such as closer planting and deeper plowing, which were universally popularized with little preliminary testing. All of these measures, taken together, were expected to produce fantastic increases in crop yields almost immediately. Since Mao's rural program had to accomplish something Stalin hadn't needed to do, namely to create a surplus product rather than merely extract an already-existing one, it was necessary to gain an even tighter control over the peasants' labor-power and means of production than Stalin had attempted: this, and not an ideological vision of communism, was the motive behind the People's Communes. (3) It is the third aspect of the Maoist development strategy that has attracted the most attention from Western radicals: its relative egalitarianism. On this point, Mao certainly departed significantly from the Stalinist precedent; where Stalin imposed austerity only on the masses, Mao wanted to force the cadres to make sacrifices as well. Yet here, too, it can be argued that Mao only altered the Stalinist model in order to adapt it to the greater economic backwardness of China. The economic rationale of Mao's egalitarianism has in fact already been elaborated in some detail -- not by Mao's detractors, but by his admirers, who aim to defend him against the charge of economic irrationality and utopianism. (35) It is often pointed out, by scholars sympathetic to Maoism, that restriction of the bureaucracy's consumption was necessary to prevent it from becoming a drain on investment. And making the cadres participate in physical labor served not only to ensure that they helped to earn their keep, but also to allow them to supervise the workers and peasants more closely. (36) Similarly, Mao's educational reforms were aimed at slashing expenses on elite universities and stressing vocational training geared to the immediate needs of industry. Even his rural health program can be explained as intended "not only to relieve the hardship of chronic and almost universal bad health, but to minimize the consequent inefficiencies so that the population [could] get as much effective working energy as is possible out of a relatively low calorie intake." (37) The Maoist emphasis on liberating women by drawing them into the labor force, likewise, was a corollary of the labor mobilization strategy, which required the largest possible workforce. (38) Once it is realized that there were practical economic reasons behind all of these "egalitarian" policies, however, there is no longer any need to assume that Mao was motivated by socialist values; thus, the defense of his economic rationality undermines the image of Mao as humanistic reformer. Within months, the modified Stalinst program had run into the same problems as the orthodox Stalinist model. The speed-ups had familiar results: poor quality products, machine breakdowns, accidents, and worker unrest. Over-investment gave rise to competition for scarce resources, and as usual it was light industry which was sacrified. Furthermore, the State bureaucracy had difficulties managing the factories which it had taken over without adequate preparation. In the countryside, the situation was no better. Many peasants, still resenting being forced into collectives, resisted in the usual ways. They had further grounds for complaint: Mao's rural development plan increased their workload and lowered their living standards by cutting into the time available for family handicraft production and cultivation of private plots. Perhaps the most serious problem -- one which was to arise on a much wider scale in the Great Leap Forward -- reflected a consistent flaw in Mao's approach to rural development: new tools and techniques were adopted indiscriminately. Perhaps the most notorious example was the two-wheel, two-blade plow, one of Mao's hobby-horses. Hundreds of thousands of the plows were built in 1955-56 and sold to peasants who sometimes had to be forced to buy them. As it turned out, most of them had to be scrapped because of technical difficulties: the plows were too heavy and sank into the mud, there were not enough draft animals to pull them, etc. Errors of this sort, combined with bad weather, produced a disappointing harvest in 1956. Mao's crash industrialization program had to be abandoned. The speed-up drive was halted, wages were raised, and workers were promised that the urban housing shortage would be relieved. The percentage of investment in light industry was to be increased. Concessions were also made to the peasants: private plots were restored where they had been taken away, rural free markets were re-opened, and prices for some agricultural goods were increased. Mao's Twelve-Year Agricultural Program was shelved. Many of the cadres who had opposed collectivization were released from the camps and restored to their posts, while those who had carried out the Leap-Forward program too enthusiastically were criticized for "commandism". At the Eighth Party Congress in September, the talk was all of modest, realistic planning and balanced growth. With his program in trouble, Mao wisely retreated -- or was forced to retreat. At a Politburo meeting in April, he delivered a speech, "On the Ten Major Relationships," which incorporated many of the proposals of the Bukharinists. This speech has misled a number of scholars into concluding that Mao was himself a Bukharinist, or at least a critic of the Soviet heavy-industry-first strategy supposedly favored by his opponents. (40) But as we have seen, it was not Mao, but his opponents, who first questioned the priority of heavy industry; and Mao only adopted this position when his own policies had failed and were under attack as "adventurist. " This suggests that Mao's April speech represented a public concession to his opponents, not a statement of his own views. And in fact, it has been recently disclosed that Mao did not write " On the Ten Major Relationships"; the main drafter was one of Mao's Bukharinist critics. (41) Only by ignoring these facts can one make a case that the "Ten Major Relationships" demonstrates that Mao rejected the Stalinist development model; yet, this speech is the most important piece of evidence for the claim that Mao advocated a more consumer-and-agriculture oriented development program. Clearly, the theory rests on a shaky foundation. For a few weeks in the spring of 1957, at Mao's insistence and against the will of most of the Politburo, open criticism of the Party by non-members was permitted -- indeed, demanded. In keeping with the standard interpretation of Mao as an opponent of bureaucratic oppression, this episode is usually seen as an attempt to make the Party more responsive to popular sentiment. However, there is another way of looking at the matter. In 1956-57, Mao was somewhat under a cloud; his policies had been rejected and his personality cult was being undermined (by, e.g., the removal of any reference to "Mao Zedong Thought" from the Party Constitution). (42) When out-voted in the Politburo, Mao often appealed to forces outside the Party's inner circle; sometimes -- in the case of the 1955-56 collectivization drive, for example -- he looked to other elements of the Party bureaucracy for support; sometimes he sought allies outside the Party, the most spectacular case being the Cultural Revolution. The Hundred Flowers Campaign can be seen as yet another of Mao's attempts to pressure his colleagues into accepting his policies by manipulating social forces. Faced with vehement attacks, including calls for the overthrow of Party dictatorship, the CCP put a quick end to the free speech movement and counterattacked with an "antirightist" campaign. Apparently, Mao had suffered another setback; not only had he failed to garner support for his economic projects, but he had provoked the resentment of Party members by forcing them to submit to outsiders' bitter denunciations. The Party, it seems, took a subtle revenge: quite a bit of personal invective against Mao was published in the official press, under the pretext of reporting the evil sayings of "bourgeois rightists." (45) Yet less than six months later, Mao was able to revive his Leap-Forward policies of 1955-56 on a much larger scale over the continuing opposition, or at least skepticism, of a large part of the top Party leadership. How did Mao transform apparent defeat into victory? While support from the provinces was important to Mao, the strongest impetus to the revival of his neo-Stalinist program was no doubt the fact that the "right" turn of 1956-57 was not having the desired results. (49) Despite concessions to the agricultural producers, the performance of that key sector did not improve. Rural cadres, under less pressure from above in the last half of 1956, set lower quotas for the collective fields and reduced local investment. Mediocre weather also had its effect, and State grain procurements after the summer 1957 harvest fell short of the official quota. Furthermore, even before the Hundred Flowers Movement, the general relaxation of controls was threatening to get out of hand. Thousands of peasants deserted the collectives in late 1956, and not all could be persuaded to return; and those who remained within the collective farm system often collaborated with the local cadres in undermining it. The officially sanctioned expansion of private plots also undercut the peasants' obligations to the State and reinforced their tendency to devote more labor-time and apply more organic fertilizer to their own land than to the collective fields. In the cities, workers reacted to the Party's vacillations of mid-1956 by staging dozens of strikes in the latter part of the year and the first half of 1957. (50) Thus workers and peasants responded to the Party's conciliatory gestures of 1956-57, not by working harder to achieve new economic successes, but rather by airing old grievances and pushing for further concessions. Politically, as well as economically, it seemed that the right turn was leading to a dead end. It is not surprising, then, that the Party was amenable to being persuaded to change courses once more -- especially since the repressiveness of the Stalinist program suited the bureaucracy's defensive and retaliatory mood after the Hundred Flowers. Furthermore, a good deal of China's social unrest was directly attributable to economic stagnation; in this light, a crash program may have seemed the most plausible way out of a potentially dangerous situation. It was in this general atmosphere -- a closing of Party ranks against outside criticism, a tightening of control over the masses -- that the first clear signs of a return to the Maoist strategy appeared. (54) A revised version of Mao's Twelve-Year Agricultural Program was on the agenda at the fall Central Committee meeting, and several of the slogans of the mini-Leap Forward were heard again. "Socialist education" in the countryside was intensified; now the main target was the "rightist conservatism" of the lower-level cadres, who had complained that the Party was squeezing too much grain out of the peasants and driving them to rebel. Some 3 percent of the basic-level cadres were purged. Hundreds of thousands of urban bureaucrats --"conservatives" who doubted the wisdom of the Party's turn to the "left" -- were criticized and sent down to work in factories and villages; they could redeem themselves by helping to strengthen the management of collectives and factories. Throughout this period, from the summer of 1957 to the early fall of 1958, Mao was extremely active, touring the provinces time and again, no doubt to canvass support for the GLF. In November, he went to Moscow in search of economic aid, the last of China's Soviet credits having been exhausted; he returned to Beijing with empty pockets. It was clear that China would have to develop solely through its own efforts; this may have provided Mao with the clinching argument for mounting a new crash-industrialization drive. At any rate, it was only after Mao's return from Moscow that the Great Leap Forward really got under way. Over the winter of 1957-58, tens of millions of peasants were drafted into labor armies and put to work, almost bare-handed, on irrigation and flood control projects, fertilizer collection, pest control and land reclamation. Many of these undertakings, requiring more laborers than a single collective could spare, could only be organized through the joint efforts of several collectives: it was already becoming evident that the Maoist development strategy would require a higher level of collectivization. While the industrial Leap Forward was gathering momentum, more elements of the Maoist agricultural program were introduced, including the building of small factories and the reform of techniques, such as closer planting. In July 1 August, Mao proposed the creation of a super-collective, the People's Commune, which would give the State greater control over the peasants' labor-power and means of production. As in 1955-56, the new upsurge of collectivization was initiated by Mao and only ratified by the Politburo after the movement was under way. The outstanding feature of the Communes was the vast amount of labor they mobilized. Everyone worked longer and harder, often to the point of exhaustion. Officials at the Commune level could draft peasants at will to work in factories or labor-intensive projects. With most of the men thus occupied, women replaced them in the fields; public mess halls and nurseries supplanted the women's traditional domestic labor. Private plots and household production were abolished; all of the peasants' labor-time was to be at the State's disposal. The peasants were motivated to join the Communes, it has been argued, by the offer of generous grain rations, made possible by the excellent summer harvest. This sounds plausible enough; but, if there was any such increase of rations, it must have been very short-lived, for once the Communes were established the emphasis shifted to austerity. Before the Leap Forward, some 90 percent of each harvest was distributed among the peasants. In the People's Communes, the official norm was 60 percent for consumption, 40 percent for reserves and accumulation; and some Communes reported that they had distributed only 30 percent to the peasants. (57) Even taking account of the exceptional harvest of 1958 (25 percent above the 1957 level, according to official statistics; 11 percent according to Western economists), it seems clear enough that living standards must have declined for most peasants, though some few may have gained from the general leveling of incomes. Maximization of the rate of exploitation of the peasantry was evidently the raison d'etre of the People's Communes. Communization marked the high point of the Leap Forward; within a few months, the Party had already begun to retreat. Provincial tours by top bureaucrats in November and December revealed widespread peasant discontent over low rations, too much work and the authoritarian methods of the rural cadres. At year's end, there was a campaign to "tidy up" the Communes. A Central Committee directive declared that peasants (and urban workers) must be allowed eight hours' sleep and four hours for rest and meals every day, women must not be required to do heavy work immediately before or after giving birth, and the armed rural militia must not be used to "impair ... democratic life in the communes.'' (58) Sideline production was again legalized. The campaign to build small iron and steel plants throughout the Communes and cities was halted, as most of the output of the backyard furnaces was unusable. The retreat from the GLF continued into 1959. The situation in industry was chaotic: shortages of raw materials, machine breakdowns, deterioration of product quality, and mounting accident rates. The pace had to be slowed; central planning had to be restored. The rural masses were still restive; cadres and peasants conspired to hide grain from higher authorities. A first step towards the dismantling of the Communes was decided upon that spring: the production brigade (that is, the old collective) was to be the basic unit of ownership, management, and distribution. The Communes would no longer draft labor from the brigades, nor would incomes be equalized among brigades. But before the new policy could be carried out, the tide of Chinese politics turned once more. The occasion was a frontal attack on Mao's policies by the Minister of Defense, Peng Dehuai, who castigated the GLF as "petty-bourgeois fanaticism." Peng's challenge to Mao raised the spector of a military threat to Party supremacy; he was also too close to Khrushchev to escape the suspicion that he was being used by the Russians. Hence the top bureaucrats either rallied around the Chairman or kept silent. Peng's defeat was followed, in the fall of 1959, by a new attack on "rightist tendencies," aimed at those who criticized the Leap Forward or questioned the Party's leadership. Winter 1959-spring 1960 saw a revival, though on a smaller scale, of the GLF. But the abandonment of the Maoist strategy could not be delayed indefinitely; exceptionally bad weather in 1959-61, combined with the irrationalities of the Leap itself, led to a severe food crisis. At the depth of the crisis, malnutrition was widespread, and there were famines in some of the more backward areas; in some parts of the country, hunger drove the peasants into sporadic armed revolts, which were put down by the People's Liberation Army. (59) Mass starvation was only avoided by huge grain imports. Food shortages and growing unrest required that Mao's experiment in crash industrialization be discontinued. By the middle of 1960, it was obvious that the Party's first priority must be to restore agricultural production, no matter how many concessions it might have to make to the peasants. Late in the year, the decision to transfer power down to the brigades was finally implemented. Private plots, sideline production and rural markets were restored. The peasants were allowed to keep 92 to 94 percent of the harvest. Most of the small plants were shut down, and the labor armies were disbanded. The peasants were encouraged to vent their rage upon their local leaders, who were criticized for "commandist" behavior (including murder and torture) during the organization of the Communes. (60) These measures were not enough to restore the peasants' confidence in the Party, and a year later more concessions followed. Decision-making power was now shifted down to the level of the production team (corresponding to the old cooperative). In practice, the Party had to go even farther in yielding to the "spontaneous capitalist tendencies" of the peasantry. The collective-farming system was eroded in a variety of ways: the size of the private plots was increased; peasants were allowed to keep land they cleared by themselves; collective land was rented to peasant households; and team cadres often contracted out work to the individual households, thereby restoring private ownership in all but name. These steps were not taken to the same extent in every locality, but in some provinces, half or more of the arable land was under private ownership or cultivation by early 1962. A general retreat from the Maoist/Stalinist development model was, then, the order of the day. If this had been merely an emergency program, to be followed by a return to the GLF, Mao would have had little to complain about; indeed, he himself vigorously participated in the attacks on lower-level cadres for their "leftist excesses" (that is, for carrying out his own orders too enthusiastically). But what the Party bureaucracy had in mind was more than a temporary retreat; in the mid-1960s they worked out their own alternative to Mao's neo-Stalinist strategy. The collapse of the GLF opened up a new period, which has been aptly titled "China's New Economic Policy," by analogy with the Soviet retreat from the "leftism" of War Communism. (61) Out of the immediate response to the food crisis emerged the new Agriculture-First strategy; heavy industry was now last in the official list of economic priorities. (62) Increased agricultural investment was not, it became clear, merely an emergency measure but the foundation of a long-range program. Nineteen-sixty-two marked the beginning of what one writer has called "China's Green Revolution." (63) Ten high-yield regions were selected to receive the benefits of the new agricultural investments. Heavy application of chemical fertilizers and pesticides, improved seed varieties, mechanized irrigation and more extensive multiple cropping combined to create an impressive rise in output. At the same time, there was considerable progress in research on mechanization; and in the mid-1960s, factories began to turn out a wide variety of new machines adapted to the technical requirements of Chinese agriculture. The principle of detente with the peasants was firmly established; at the Tenth Plenum in September 1962, the revisions in the Commune system were reaffirmed. Some, including Deng, wanted to go farther; they argued for legitimizing the household contracts or even (if Red Guard reports are to be believed) legally restoring private land ownership. (64) However, Mao succeeded in blocking this move. In industry, there was a new emphasis on profit quotas rather than sheer volume of physical output. The nationwide speed-ups were not revived; "socialist emulation" became purely ritualized. (Which is not to say, of course, that there were never attempts to speed-up workers in a particular factory or that working conditions were ideal; poor safety conditions have often been observed by foreign tourists. (65) ) Late in 1963, the reorganization of industry into "socialist trusts" was begun on a trial basis in several branches of production. (66) Each trust was to encompass all of the nationalized enterprises in a particular branch; the directors would be granted a wide margin of freedom from Party and State control, and investment decisions were to be based on the profit principle. As part of the industrial reorganization, plants which operated at a loss were shut down, and thousands of superfluous workers were sent down to the countryside. Potential sources of opposition to the dominant "rightist" faction also existed within the bureaucracy itself. New job opportunities were not opening up as rapidly as in the first plan period, and with the top positions monopolized by the older generation of civil war veterans, prospects for advancement seemed dim for ambitious young apparatchiks. In addition, the new emphasis on technical expertise rather than loyalty to the Party line threatened the careers of those who were unable to adapt to the new demands. Tensions within the apparatus and discontent among the urban population provided opportunities. which Mao was soon to take advantage of, for political agitation. After brief semi-retirement from the political scene, Mao returmed to center stage at the Tenth Plenum. He called for a "Socialist Education Campaign" in the countryside, designed to strengthen the collective elements of the rural economy and take back some of the concessions made to the peasants during the crisis years. (70) The 1957 campaign of the same name had prepared the way for an increase of the level of collectivization; that Mao intended a repeat performance seems likely. The peasants were encouraged to "Learn from Dazhai," a model production brigade which reportedly raised output tremendously through strenuous efforts, a high rate of investment. and voluntary austerity. One pro-Maoist author who visited Dazhai and interviewed its leader, Chen Yongguei notes -- in all innocence -- that the neighboring villages "distrusted Ch'en and his tendency to deliver the maximum amount of grain to the state." (71) That is: Chen and his brigade were agricultural rate-busters. The Daqing oilfields provided a similar model for industrial workers. The "Daqing spirit" has been summed up in the "ten no's," which include "fearing neither hardship nor death" and "paying no heed to whether working conditions are good or bad, whether working hours are long or short, whether pay and position are high or low. (72) Mao also called for a revival of the program of rural industrialization. (73) Where all of this was heading is clear enough -- back to the GLF. 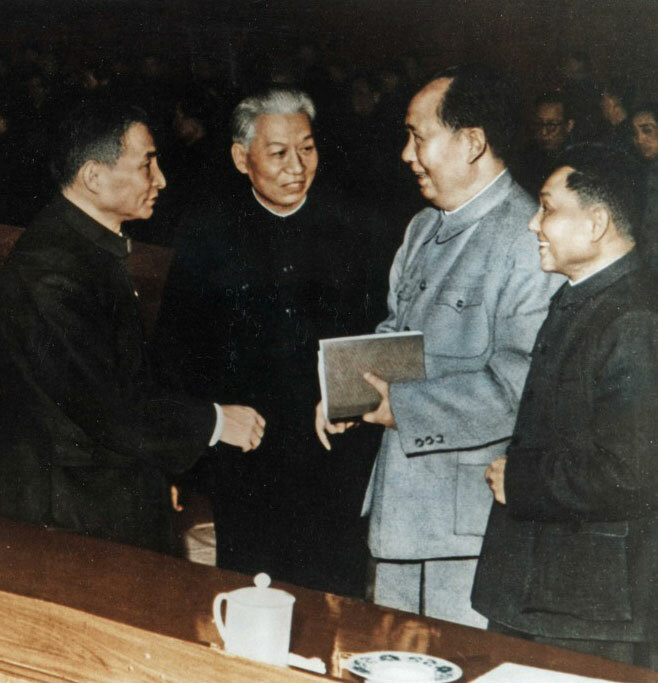 In these initiatives, Mao received the full support of Defense Minister Lin Biao. (74) It was the People's Liberation Army [PLA], not the Party, which first distributed the famous Little Red Book of Mao quotes, and it was the Army which sponsored Jiang Qing's socialist-realist refashioning of Chinese opera. The entire population was adjured to "Learn from the PLA" and from model soldiers like Lei Feng, whose only desire was to be a "rust-proof screw" in the revolutionary machinery. In the factories and villages, the People's Militia -- which fell under the PLA's chain of command -- played a major role in the "Socialist Education Campaign." By contrast, the Party claimed to be carrying out Mao's directives, but in fact consistently undermined them. For example, "socialist education" was used as a pretext for purging basic-level cadres who had supported Mao's line; among those who came under fire was Dazhai's Chen Yongguei, who was saved only by Mao's intervention. (75) Mao became impatient with the Party's obstructions and concluded that he could no longer win over his Politburo colleagues to his point of view; he would have to purge them. In the past, Mao had demonstrated his ability to manipulate conflicts within the bureaucracy and had even attempted to use the masses against the apparatus. In the coming Cultural Revolution, he would try to do the same but on a far larger scale, since he had to overcome much greater resistance from the Party this time. It would be out of place here to trace out all of the twists and turns of the Great Proletarian Cultural Revolution [GPCR], but one point does need to be made. (77) Many have seen Mao's appeal to the masses to "bombard the (Party) headquarters" as an indication that his goal was "strengthening the position of the people vis-a-vis the powerful Party and government structures." A brief look at the role of workers in the GPCR in Shanghai, where the Maoist faction accomplished its most successful "power seizure," will put this interpretation to the test. (79) All attempts by the Shanghai Maoists to topple the municipal Party Committee by mobilizing local students (reinforced by Maoist students from Beijing) were easily stalemated, as the Party proved equally adept at organizing student and worker support. It was only when the Maoists urged the sub-proletariat to revolt -- Jiang Qing denounced contract labor as "capitalist" and promised to abolish it -- that the Party's power crumbled and the "Gang of Four" stepped into the ensuing power vacuum. Once in charge, however, the Maoists retracted all of their promises to the underprivileged workers; their organizations were branded "counterrevolutionary" and broken up by the police. Although most of the city's workers refused to obey the Maoists back-to-work order, their strikes were gradually broken by soldiers, students and Maoist workers. A show of force by the local PLA garrison -- its commander declared that it would "ruthlessly suppress" all opposition to the new administration, and troops were paraded through the streets to back up the threat -- may have contributed to the success of the Maoists' strikebreaking. It could hardly be clearer that the masses played a limited role in Mao's scheme. Although they made the "revolution," the workers and students were to have no part in defining its goals. Since the Army, led by a loyal Maoist, was in control, it might have seemed at first glance that conditions were ideal for a revival of the GLF development strategy. But the Army itself was ridden with factional intrigues; Lin did not even have a firm grip on his central military machine, and the sympathies of the regional commanders lay with the old guard. Half of the provinces, at most, were in the hands of reliable allies of Mao and Lin. Mao's "revolution" had been far from a total success. Nonetheless, the Mao/Lin faction did try to revive the Leap Forward in 1969-71. (81) Lin Biao raised the banner of a new "Flying Leap" inscribed with old Maoist slogans, such as "More, better, faster, cheaper." The GLF's "Everyone a Soldier" motto was echoed by Lin's demand that "700 million people, 700 million soldiers ... become a single military camp." The most consistent Maoist advances were made in the fields of education and culture, the strongholds of the "Gang of Four." In industry, material incentives came under attack, and there were sporadic efforts to launch a new speed-up drive. However, these policies were not applied with the same vigor as in the GLF and did not spread beyond the regions where the Mao/Lin group held power. The same might be said of agricultural policy; all of the elements of the Leap-Forward strategy reappeared, but only in limited geographical areas. Labor batalions were again set to work on irrigation projects, and locally financed rural industries flourished once more. Private plots, rural markets, and private handicrafts were threatened. There were renewed efforts to transfer decision making power up to the brigade level. After the excellent spring 1970 harvest, State grain procurements were increased. Where these policies were applied, they soon met with the same results as in the GLF and the mini-Leap; for example, peasants responded to the higher procurements by slacking off during the harvesting. These attempts to return to policies which had repeatedly proven dangerous no doubt solidified Party resistance to Mao and his chosen successor; by September 1971 Lin had permanently vanished from the scene, and along with him went Chen Boda, Mao's chief theoretician and (some say) ghostwriter. Several conflicting stories were issued by the authorities; the final version was that Lin had died in a plane crash while fleeing to the Soviet Union after a failed coup d'etat. Whatever the truth about the Lin Biao affair -- whether he actually did clash with Mao (perhaps over foreign policy, as Lin is known to have opposed detente with the US) or whether Mao simply went along with a purge which he was powerless to prevent (82) Lin's fall was in any case a fatal blow to Mao's hopes of resurrecting his neo-Stalinist development strategy. It deprived Mao of his main source of military support and marked the beginning of the decline of the Maoist faction that culminated in the arrest of Mao's last handful of loyalists after his death. From 1973 to 1976 Mao's personal entourage, the "Gang of Four," launched a series of increasingly desperate attacks on the "revisionist" old guard, which was steadily regaining the ground it had lost in the GPCR. (83) Most of the purged "capitalist- roaders" were rehabilitated, despite the Maoists' opposition. The "Criticize Lin Biao, Criticize Confucius," "Study the Dictatorship of the Proletariat," "Criticize Water Margin," and "Criticize Deng Xiaoping and Beat Back the Right Deviationist Wind" campaigns were all episodes in the Maoists' futile struggle to mobilize the masses for a new Cultural-Revolutionary assault on the Party "rightists." The issue at stake in this ongoing political contest was the fate of Mao's social and economic program. The final act in the drama, played out in the two years after Mao's death, pitted Deng's "rightist" old guard against a moderate Maoist group, led by Hua Guofeng and consisting of bureaucrats who had advanced during the GPCR but were not identified with the more extreme form of Maoism represented by the "Gang." The details of this stage of the struggle will be examined in the next issue of this magazine; for the moment, it will suffice to note that the battle has ended in total victory for Deng. The last vestiges of Maoism are being eradicated, and the Bukharinist program has been implemented even more thoroughly than during the early 1960s. Political conflict will undoubtedly continue in China, especially if the new right turn leads into another blind alley; but, it does not seem likely that the Maoist/Stalinist development strategy will ever be revived again. I hope the reader will agree that this fact is no occasion for regret.